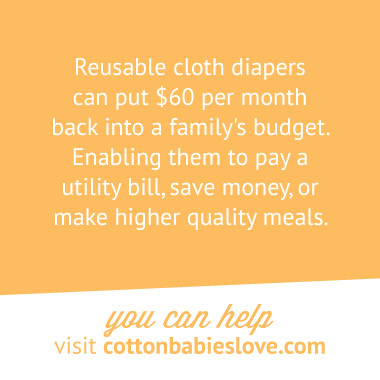 Cloth diapers can save a family up to $60 each month and more than $2,000 a year. When a family receives cloth diapers from Share the Love, we are helping put this money back into their budget, creating more opportunities to buy better meals, pay a bill and save for the future. There are many ways to join Share the Love in eliminating diaper need. No matter how you decide to get involved, your contribution is far from small and will make a difference in fighting poverty throughout your community. Diaper need is a growing concern in the U.S., but often goes undetected. You can help raise awareness about this issue with Share the Love. Taking action is easy when we act together. Tell a friend about diaper need. Reach out to someone who may need assistance from Share the Love. Educate your community about diaper need and the effect it has on local families. Download and distribute any of the free resources and materials we have available. Do you work for a public service organization and want to know more about Share the Love? Please enter your email address below to receive information and learn how this program can help low-income families by you. Stay informed about diaper need and see how Share the Love is tackling poverty in your community by keeping up with us on Facebook and Twitter! Include #sharethelove in your discussion, or use any of the images below on Instagram or Pinterest to connect more people to Share the Love. Share the Love has helped my family tremendously. Receiving these donated diapers is truly a blessing and relieves tons of financial stress. Here is some more heartbreaking stuff from Brittney about how this program has done awesome things. Yep more stuff here. And yet some more items. I really miss Saturday morning cartoons. I wish I could be 7 for like hop here is some more copy. Done with diapers? Donate your extra cloth diapers to a family in need through Share the Love. We are always seeking cloth diapers from brands like bumGenius, Flip Diapers, GroVia, Econobum, Bummis, FuzziBunz and more. If you want to donate your cloth diapers to a family in need, please fill out the form below to contact a Share the Love host site close by. Don’t worry — your information is safe with us and will not be shared. Give a gift to a family in need by purchasing a cloth diaper through Share the Love. Your donation can be distributed to any Share the Love host site of your choice, or you can opt to send it to an area that needs it most. Your gift will lift local families out of poverty, ensuring more babies stay healthy with clean diapers. Through a network of thoughtful and dedicated individuals, Share the Love has been able to open more than 100 host sites across the country. Each Share the Love host site is ran by a volunteer who coordinates all outreach efforts, including cloth diaper collection, loans and distribution. By partnering with Share the Love host, you are bringing invaluable resources to struggling families. Fill out the form below to open your volunteer host site today. Check your inbox soon for a link to the application.